The recent midfield signing, Arthur, has finally debuted his appearance for F.C Barcelona substituting in the last quarter of the club’s first league game against Deportivo Alaves. Playing merely for the last 13 minutes as the left central midfielder, the 22-year-old was not without a vital influence on the game, let alone his assist to Coutinho’s goal. He has it what would add value to Barcelona’s defensive and tiki-taka set up. 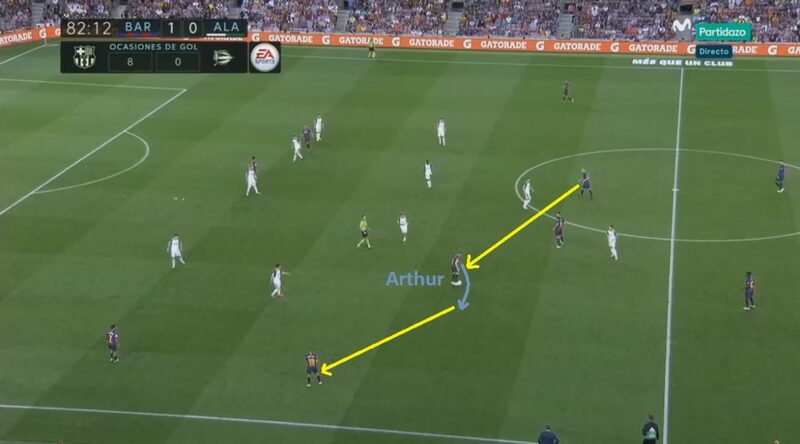 Here is the detailed tactical analysis of Arthur’s performance on his debut at Barcelona. 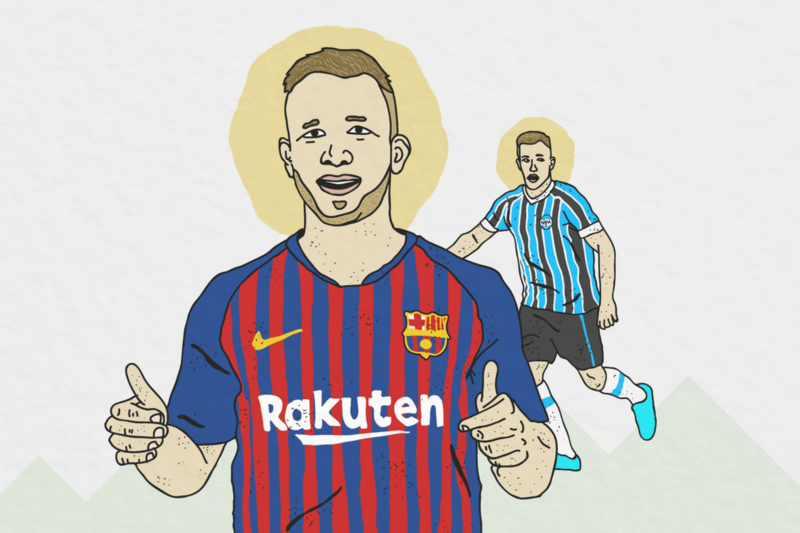 With his solid positional awareness; a sharp line of sight; and the ability to read the game and the opponents, Arthur showed his intense presence against Alaves. When off the ball, he intelligently positioned himself to block the key spaces between the opponents. The picture below exhibits a glimpse of the defensive moves of the Brazilian in his debut fixture. The midfielder stopped the opponent ball-carrier first with his speed and a potential tackle which would force the later to pass to his teammate only to get the ball back after some distance. But the young Brazilian international followed him back blocking his passing route from the inside. 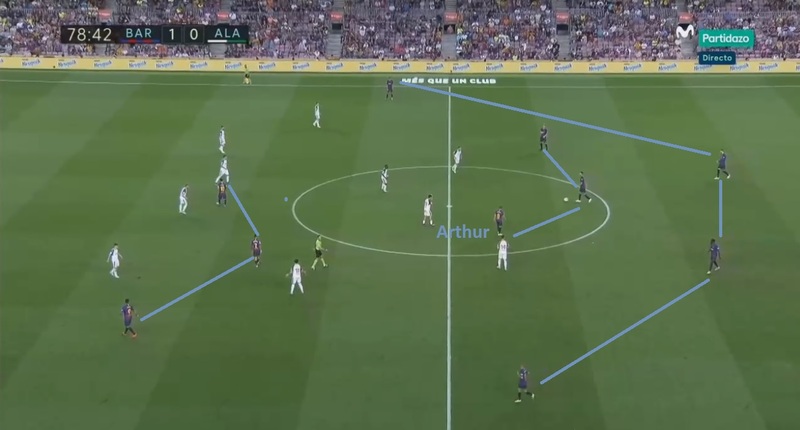 This way Arthur not only covered the depth with his dynamic defensive positioning but also slowed down the attack Barcelona was about to concede. 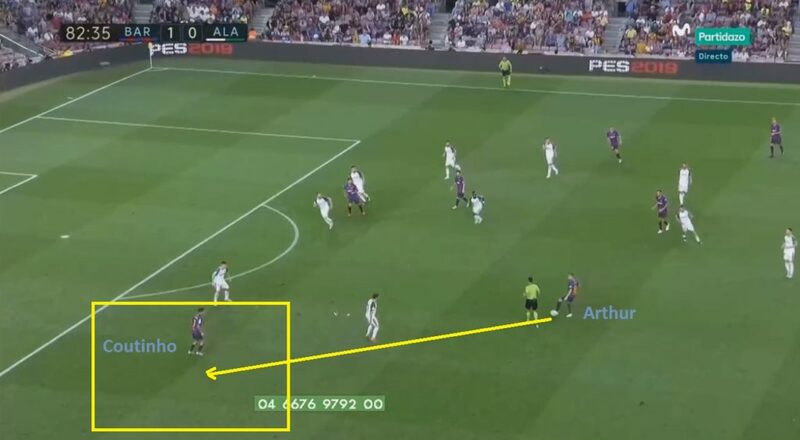 Arthur played with a 4-3-3 set up when substituted in the last quarter with Rakitic as his right counterpart in the central midfield and Busquet at the base of it. 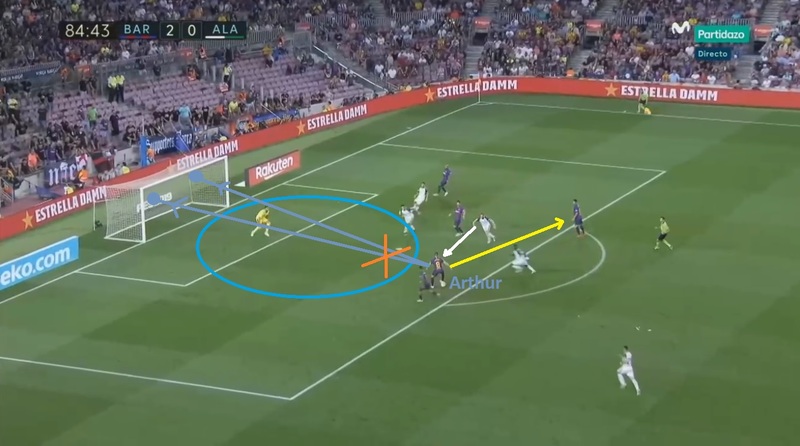 (Valverde switched to this formation by the second half from the 4-4-2 in the first half when he brought Coutinho in the central midfield replacing the right-back Semedo for Roberto.) The formation changes with Arthur in the last quarter then made Coutinho move up as the left winger-forward. 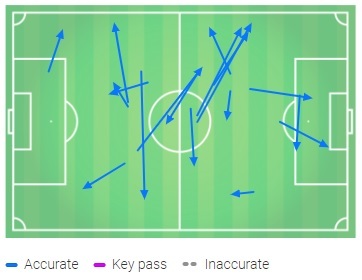 Arthur’s position at the left of central midfield, which was used to be played by Iniesta before, is a booming stage for him to not only show his defensive intelligence as a midfielder but also his passing acumen. Against Alaves, he was found to keep picking spaces and adjusting his position and the line of sight confidently in accordance with the movements of players. 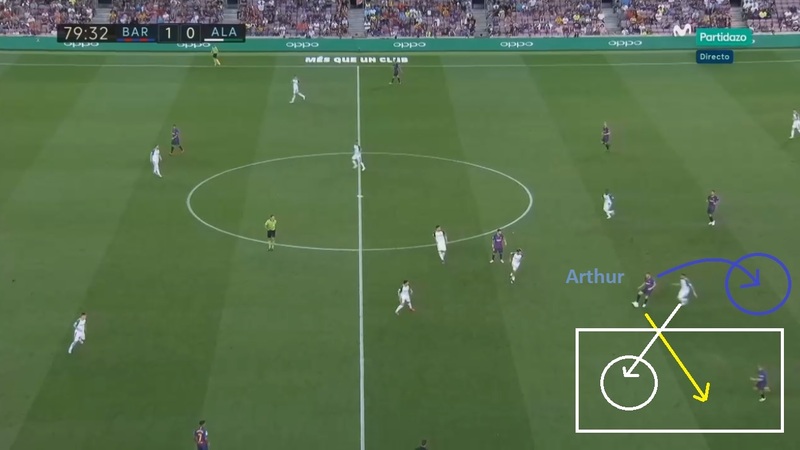 In a snapshot of the fixture below, as Arthur passed to his teammate, the opponent went on to press the later from the front which opened space behind him. Arthur dropped into that space to enable his teammate to pass him back and take the ball out of the press. Arthur is recognised for his amazing passing accuracy. He completed all 18/18 passes against Alaves, as per Wyscout.com. His passing talent is what would steepen his performance curve in the offence over time. Other than the passing accuracy, Arthur has a good ball control and dribbling skills. 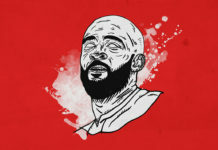 Although he didn’t get to dribble much with the ball in such a short time span and the passing game played of the team, he still showed very comfortable on-the-ball moves. Specifically, his ability to turn with the ball ensured a smooth shifting of the play across the planes. Arthur turning with the ball. As explained above, Arthur has a remarkable talent to look for spaces and adjust himself accordingly to receive the passes in those spaces. He also has a strong sense to pick space for his teammate to create for the later. 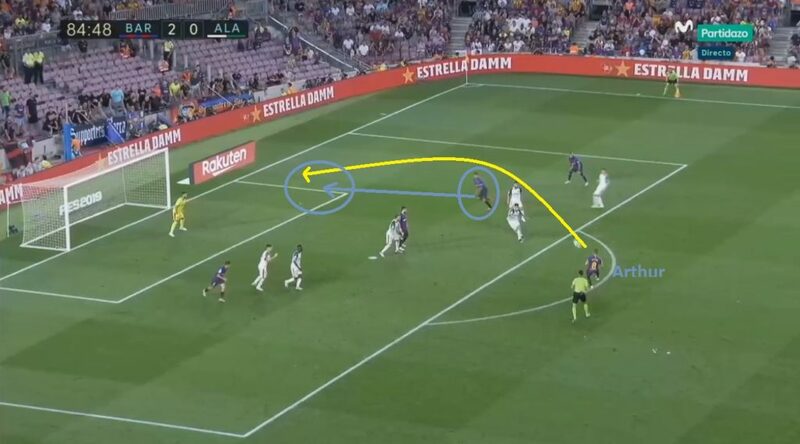 One instance against Alaves where Arthur created for his teammate was his assist to Coutinho’s goal for which he picked the space for the later at the wide left of the outfield just outside the box. His lob passes are also his great assets which he uses from outside the offensive box to bypass the opponents and create for his teammates. In fact, against Alaves, the best ‘creating action’, shot assist, by the midfielder was his lob pass for Suarez which had the ball land in a very dangerous area picked by him (however the forward couldn’t finish it). This ball-chipping ability is very unique especially against a compressed defence which leaves space behind it, and during transitions as well when the defence is not settled yet. Arthur lob pass for Suarez. In short, Arthur has had a good start under Valverde. He fit well with the defensive dynamics of Barcelona owing to his great awareness of the surroundings, positioning, space-picking, and on-the-ball skills. We can say that he sounds like the young, modern-day version of Xavi Hernández. However, there are some individual factors, which the young Brazilian needs to work on to furnish his future at Barcelona. Firstly, Arthur seems not so confident about finishing. Or he may be too much into passing and creating that he often overlooks the finishing opportunities. Against Alaves, he missed one such chance when he had an all-open area to hit the goal but he instead took time to have an opponent press him and after which he picked the space behind that opponent to pass to his teammate. Arthur not confident in finishing. Secondly, Arthur does have an excellent line of sight both on and off the ball and even when he gets engaged in the passing plays. 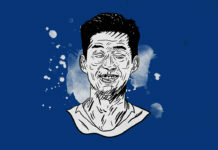 But, once he is into an intense dribble run he sometimes takes the attention off his surroundings causing him to miss picking the space or the open teammates in the other planes around him. Against Alaves though, he didn’t get to dribble much though. But that’s something he needs to work on eventually. Arthur is not in the starting line-up yet. But he would work his way up to there by the next season probably, given that he consistently makes appearances for Barcelona with the increase in his playing duration. I have emphasised it before too that Arthur is very young and has time to improve in the offensive department and follow the footsteps of his predecessor Iniesta. 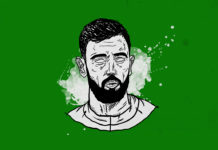 By playing as the left central midfielder for the Spanish league giant, Barcelona, the €31 million signing can develop his offensive profile and emerge as a smooth connection between the midfield and the attack with time.